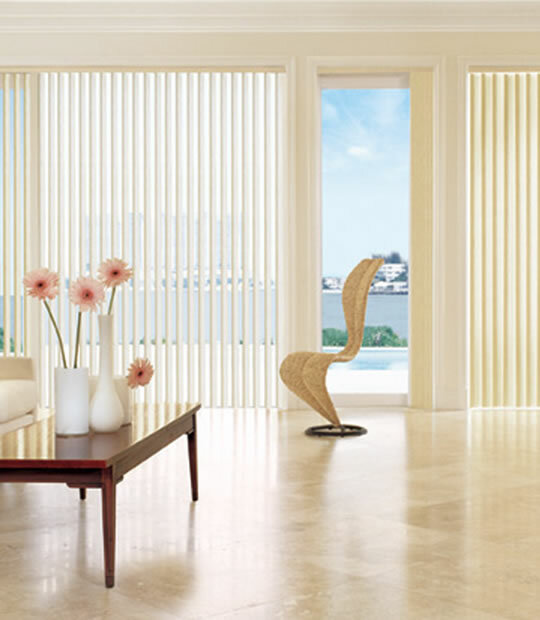 Smooth Vertical Blinds are ideal for sliding glass doors, or any large window. Practical and fashionable, our collection of custom smooth vertical blinds are the most versatile of all window treatments. Paired with a contemporary valance, you have an ideal window covering for any room in your home. Easily maintained, with excellent light control, you can enjoy our Smooth Vertical Blinds at a Discount. And unlike other vertical blinds at a discount, our headrail system incorporates self lubricating wheeled carriers to give you years of smooth operation, and louvers that will stay in alignment. 3 1/2" Dust cover valance included with vane matching insert. Available with left or right stack free of charge. Split draw or opposite stacks are also available free of charge. Smooth PVC vanes available in neutral and popular colors. Aluminum headrail with self aligning carriers for easy operation. Minimum depth for inside mount = 2 1/4". Made from 100% PVC, a durable, low maintenance material. These blinds come in cord tilt only. 3 3/4" Minimum required depth for a flush inside mount.